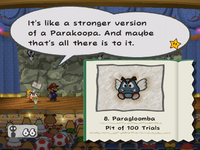 Goombella using Tattle on a Paragloomba in Paper Mario: The Thousand-Year Door. Tippi using Tattle on a Frackle in Super Paper Mario. Tattle is a move that is used in the Paper Mario series. The move can be used in battle or in the field. Used in battle, by a partner character who informs about the enemy selected, listing their HP, Attack power, and Defense power. In Paper Mario, Goombario lists stats from memory, while Goombella reads the information out of the Tattle Log in Paper Mario: The Thousand-Year Door. In Super Paper Mario, Tippi displays the information. The Tattle partner is always the first partner gained in the game. In Paper Mario, some targets cannot be tattled on in battle, including General Guy's light bulb, the slot machine in Shy Guy's Toy Box, and Fuzzipede, since the scenery becomes too dark for Goombario to use Tattle on him. However, Gulpits' Rocks, an inanimate object, can be tattled on. Tattling an enemy will also make a health meter appear under the enemy, indicating how much HP it has left. The health meter will then appear from that point on whenever Mario encounters the same enemy. On the field, the partner will tell Mario about his surroundings, and if there is a character or object near, he or she will tell Mario about that character or object. Goombella's version of Tattle adds an Action Command and a Stylish Move. Additionally, the Tattle Log will automatically update its data if an enemy becomes stronger (as some recurring bosses do). It is also possible to fail tattling in battle if the player does not stop the cross in the circle. Bosses who are not tattled on will get their tattling papers in Professor Frankly's wastebasket, where Mario can get them. 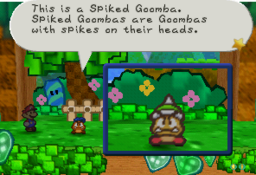 Oddly, Goombella uses the Tattle Log in battle, and recites from memory outside battle. Mario can also always view the HP and remaining HP if he has the Peekaboo badge. In Super Paper Mario, tattling works differently to accommodate the heavier focus on platforming and lack of turn-based battles. Mario's main partner, Tippi, uses the ability. Tippi's replica, Tiptron, can also use it. At any time, the player may point the Wii Remote at the screen. Tippi will turn into a large cursor and the screen will freeze and darken. The player can move the cursor over an enemy or object by pointing the remote and press to see the tattle. In this game, the tattle ability can also reveal invisible objects and, in some cases, make them visible. The only bosses that can't be scanned by Tippi are the Underchomp and Dimentio. In Dimentio's first battle in Chapter 3, Tippi is still captured by Francis, and for his second battle in Castle Bleck, Mario and Tippi leave Luigi to fight him alone. It is unknown if this was done on purpose or not. The Underchomp cannot be tattled at all due to the turn-based nature of the fight.. Despite this, it still has unused Tattle text. Big Blooper is the only one that can't be tattled during its fight but can be tattled later on. Also, Bowser and Francis cannot be tattled during their first fights, but can be tattled in the second. Tattle returns in Paper Mario: Sticker Star and Paper Mario: Color Splash, used by Kersti and Huey in the same way Tippi does it. However, only field tattles can be used. In Super Mario RPG: Legend of the Seven Stars, Mallow can perform a similar move called Psychopath. Luigi can do something similar using the Game Boy Horror in Luigi's Mansion. Monoshiri Well informed person; walking dictionary. This page was last edited on February 28, 2019, at 14:18.